I do, and just added 2 more pairs today…this will bring my collection to 10…maybe 11? I need rehab. I only have 2 feet. Lol! That makes me feel so much better knowing I’m not alone. It’s good to have options because conditions can change, a shoe might suddenly fall apart and you need a back-up pair – lol. Maybe we should start a support group? Adidas make awesome tennis shoes! I’ve noticed the widths are a bit wider in a men’s version of the same make and model and of course the colours are different. For some reason they don’t make the men’s shoes pink and purple. 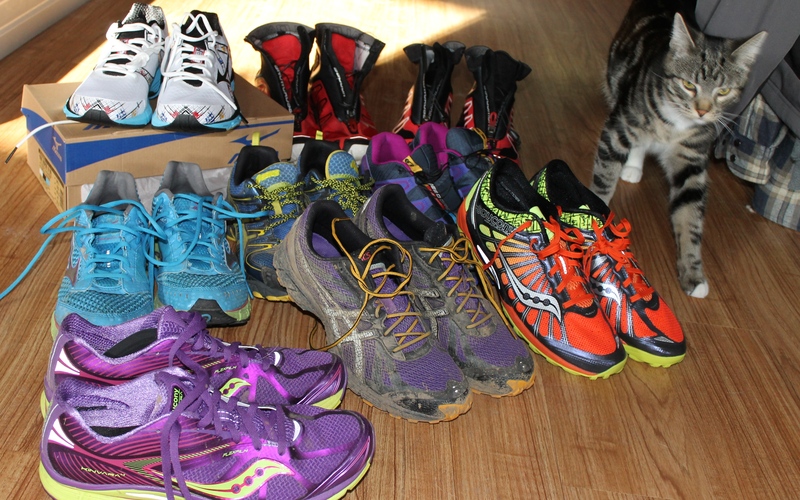 We have the orange trail shoes you have in your pic..the Saucony ones. They are light which is great but just to let you know that the grip on them in wet/dry/dusty rocks is not that great. They are good for trail that is dry but we find they slip a little on rocks in either condition. Happy running and I love all the colors. Men’s shoes are too wide for me as well. Darn long toes hey! I could have so many pretty shoes if it wasn’t for them. t should try the GT2000. I’ve tried New Balance but I find the toe box doesn’t fit my feet quite right and I get blisters. Thanks for the heads up about the Saucony trail shoes. I’ll be cautious when test driving them. Yes, I found the same with NB when I started running. It wasn’t until I moved to Victoria that I found the right shoe for me. Good luck! You need to do a review of the Saucony Kinvara trail when you break them in. I love my Kinvara’s and want to try the trail version. I like the Kivara’s too and that was the main reason why I got the trail version. I’ll for sure do a review. I have a collection of brooks pure flows. I was thinking of tweeting them a pic to see if I can get something for free! Hope you get to run soon! I’ve never tried brooks, I’ll have to add them to my collection perhaps. Good idea to tweet them a photo, free stuff is the best. I’m all about the Pure Flow. That’s a good yogi master name too. Mine isn’t as extensive as yours, but I have 5 pairs of runners! I think my collection of workout clothes is a little on the excessive side though haha. Ohhhh, I love work-out clothes too. Lots is good, then you don’t have to do laundry as much!